With no coin in the coin slide... Note also the previous coin played in the round window on the left. Notice the fingers above the wood cabinet, they feel for a coin and stop the slide when no coin is found. The ratchet has not started clicking. The previous coin is still visible in the window. A coin is placed in the coin slide. It must fit the size of the hole and be the correct thickness. The fingers feel for a coin and find it acceptable. Note the fingers do not go down like in step 2. The ratchet turns around in the box. (See ratchet explanation below.) The slide can be pulled back if for some reason the fingers lock and reject the coin. The coin slide is pressed in all the way and the new coin is visible in the window. The ratchet is freed in preparation for turning the other direction. The slide is now partly pulled out. The ratchet is engaged in the reverse direction, preventing the slide from being pushed in again. The coin slide is now pulled out completely and is ready for the next coin. The ratchet is pointed in the wrong direction but there are no teeth to grip and prevent the next push. The ratchet is an "L" shaped finger that pivots. It has a spring attached to the base of the "L" that attempts to keep the top of the "L" pointing at the edge of the coin slide. A larger image of it is included in the view above. 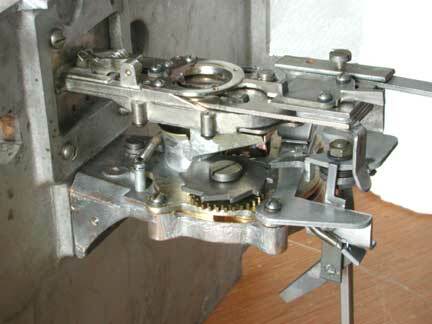 The ratchet is the primary mechanism that forces the slide to complete a full stroke, once the coin is accepted. It slides along the left edge of the slide and can grip teeth cut into the side of the slide, turn around in open areas cut into the slide and slide along smooth areas. The spring tensions the ratchet against the edge of the coin slide or allows it to point at the slide when there are gaps in the edge. This shows the rejector below the coin slide. Note the finger on the coin slide that rakes across the star ratchet of the rejecter. There is also a funnel that catches the previously played coin as it drops from the slide.